Lincoln ended Aldershot's six-game unbeaten run with a hard-fought victory in the National League. 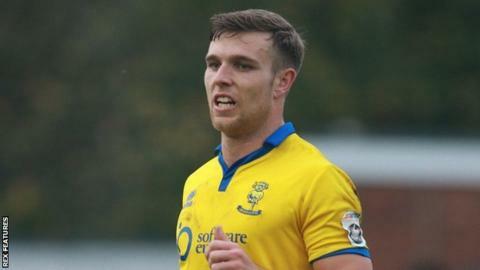 The Imps, who are now within one point of the play-off places, led when Kyle Wootton scored at the second attempt after hitting the post. Dipo Akinyemi, on loan from Stevenage, equalised with a header on his Shots debut. But Jack Muldoon scored the winner in the 80th minute with a deflected 25-yard shot. Match ends, Aldershot Town 1, Lincoln City 2. Second Half ends, Aldershot Town 1, Lincoln City 2. Tom Richards (Aldershot Town) wins a free kick. Substitution, Aldershot Town. Sam Hatton replaces Jack Saville. Foul by Damon Lathrope (Aldershot Town). Substitution, Lincoln City. Terry Hawkridge replaces Jack Muldoon. Attempt saved. Kegan Everington (Lincoln City) right footed shot from outside the box is saved. Substitution, Aldershot Town. Luke Oliver replaces Jim Stevenson. Goal! Aldershot Town 1, Lincoln City 2. Jack Muldoon (Lincoln City) right footed shot from outside the box to the centre of the goal. Substitution, Lincoln City. Liam Hearn replaces Kyle Wootton. Attempt saved. Kyle Wootton (Lincoln City) left footed shot from outside the box is saved. Damon Lathrope (Aldershot Town) wins a free kick. Attempt missed. Tom Richards (Aldershot Town) right footed shot from outside the box is too high. Goal! Aldershot Town 1, Lincoln City 1. Dipo Akinyemi (Aldershot Town) header from the right side of the box to the bottom left corner. Assisted by Dan Walker with a cross. Attempt missed. Jim Stevenson (Aldershot Town) header from the left side of the six yard box is too high. Assisted by Dan Walker with a cross. Attempt saved. Craig Stanley (Lincoln City) right footed shot from outside the box is saved. Second Half begins Aldershot Town 0, Lincoln City 1. First Half ends, Aldershot Town 0, Lincoln City 1.